The next coming release of realKNX introduces a new feature which is really interesting if you want to add some logic to your KNX installation. as you’re coming home, you may want to turn on some lights, but only if sunset is within an hour. You may want to receive a notification if you’re out and forgot some lights on. Then you would want to turn off all lights – remotely. Programming tasks like this usually requires some programming skills. Instead of using a scripting language for this, we’ve chosen a visual programming tool that doesn’t require any programming skills! This excellent tool is called Node-RED and is a flow-based programming tool, original developed by IBM’s Emerging Technology and now a part of the JS Foundation. Your realKNX objects will be available as visual nodes in the Node-RED visual editor (e.g. 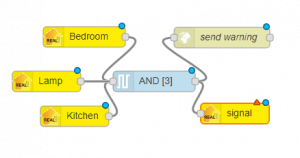 drag & drop a ‘realKNX-in’ node that listens to all changes of a particular KNX object). This feature is backwards compatible with the current realKNX v2.2, you can upgrade for free when it is released. Expected release date Oct. 2017. Finally, the realKNX Node-RED software runs on your realKNX home server in your home, i.e. it doesn’t run ‘in the cloud’ and there are no subscription fees.